You can also set the different language emails if you click on the different language tabs, highlighted in orange in the picture below. Click on the blue “Save” button to save the changes, after you have finished.This article is a step by step on where to set up the different types of email templates that the system sends. There are 6 different tabs in this page. They are Settings, Confirmation, Quotes, Payment, Payment Requests, and Other. Where can I find the page? Navigate to Settings > Car Rental > Emails highlighted in dark blue and orange in the picture below. This page is where you can find the settings for the emails and how they are in the system. For example, you can set so the system does not send any emails at all as highlighted in orange in the picture below. You can hover over the “question mark” tips to obtain more information about each setting. Click on the blue “Save” button to save the changes after you have finished. 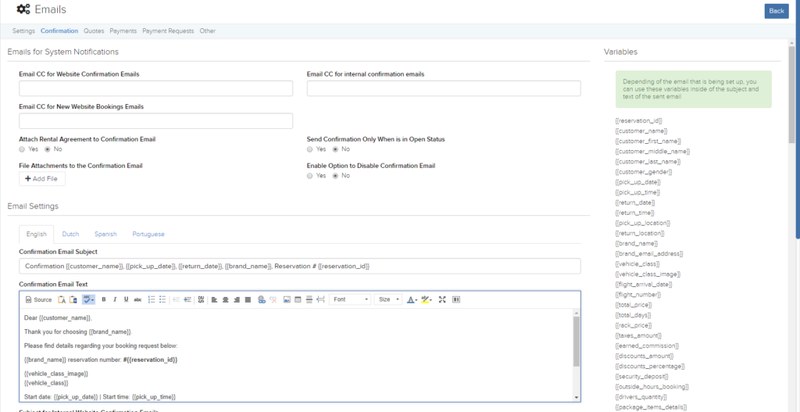 Here, you can customize the email that the system will send out to your customers when they confirm their reservation. Once you have finished, please make sure you click on the blue “Save” button to save the changes. Here, you can customize the email that the system will send to your customers when they do a quotation. 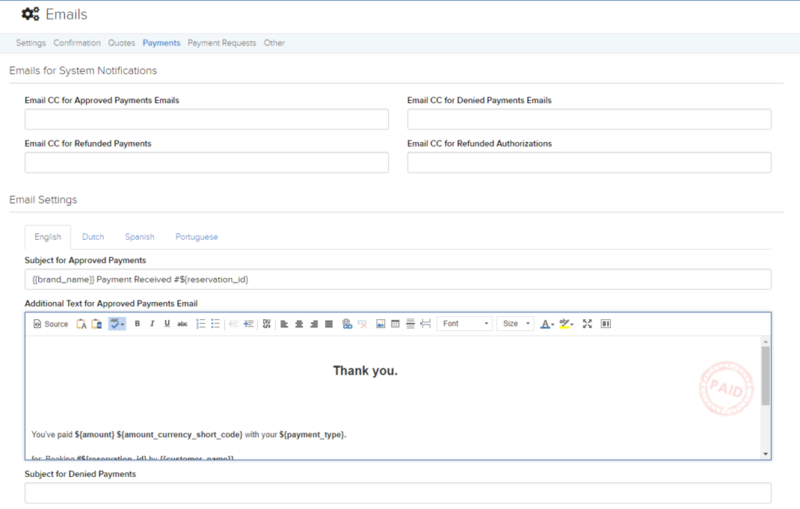 Here, you can customize the email that the system will send to your customers if it is about payments. These include payment approved, rejected, refunds for additional total, and refunds for security deposit (authorizations). 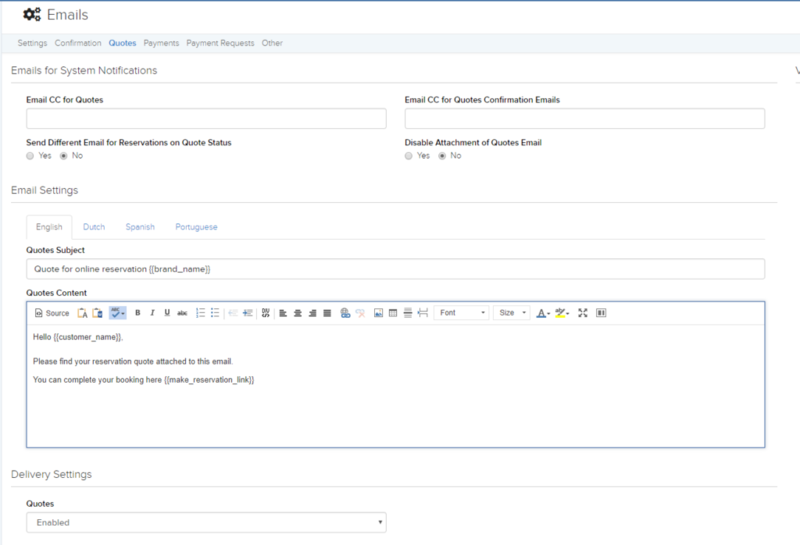 Here, you can customize the email that the system will send to your customers if it is about payment requests. Once you have finished, please make sure you click on the blue “Save” button to save the changes. Here, you can customize the email that the system will send to your customers for miscellaneous items. These include after sale emails, canceled reservations, contract emails, overbooking emails, return reminders, and additional charges availability. You can set up the number of hours after the sale has been made to send your customer the after sale email. There is also an option to disable sending this email of the reservation has an outstanding balance. You can find them by navigating to Settings > Car Rental > Emails > Others > Emails for System Notifications, as shown in the image below. The subject and body of this email can be customized. You will find the subject field and text area by scrolling down to Email Settings as you can see in the image below. Once you have set this email up, please remember to select the blue “Save” button at the bottom left-hand corner of your screen. The system also comes with a feature to set up an email for when reservations are canceled. You can navigate to Settings > Car Rental > Emails > Others and scroll down to Email Settings. There you will find a field to set the subject and body of this email as shown in the image below. You can enable the delivery of this email by scrolling down to “Delivery Settings” and shown in the image below. For contract emails, overbooking emails, return reminders, and additional charges availability, the set up is the same as for cancel reservation emails described above. Click on the blue “Save” button to save the changes, after you have finished. For each type of email template, you can use the variables located on the right side of the page. Each email type has its own set of variables that you can use.